Flatbreads are great because they can serve so many purposes. They can be topped with practially any sort of toppings for an appetizer, they can serve as a base for a pizza, they can be used as the bread for a sandwich and so many more things! This particular recipe is for a roasted garlic flatbread, with is delicious just as is with a little olive oil drizzled over the top, but you can omit the garlic and toppings and use it for whatever you would like. In a large bowl, combine the yeast, water, 1 tsp salt and 1 tbsp olive oil and let stand until bubbles begin to form (about 5 minutes). Gradually in 3½ cups flour until the dough has formed. Knead the dough on a floured surface until it no longer feels sticky, adding additional flour if necessary (about 5-10 minutes). 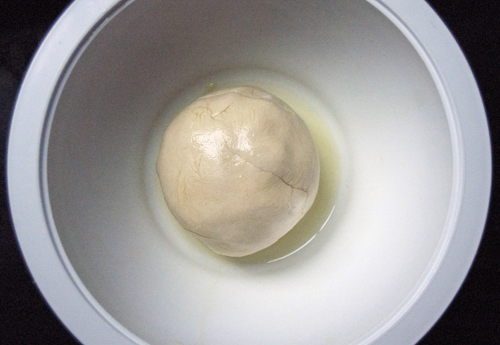 Place the ball of dough into a bowl with 1 tbsp olive oil, coat with oil, cover with plastic wrap and let rise until doubled in size (about 35-45 minutes). Punch the dough to flatten, cut into four pieces, cover with plastic wrap and let rest for 10 minutes. Preheat the oven to 450F. 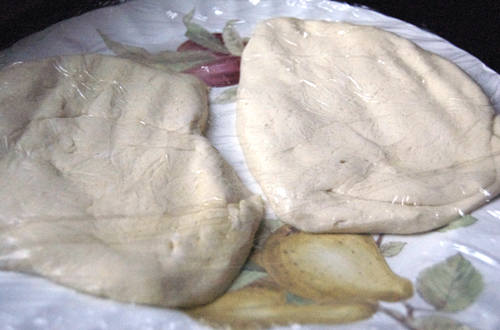 Gently stretch each flatbread into a 13x7 inch oval and place on a greased baking sheet. 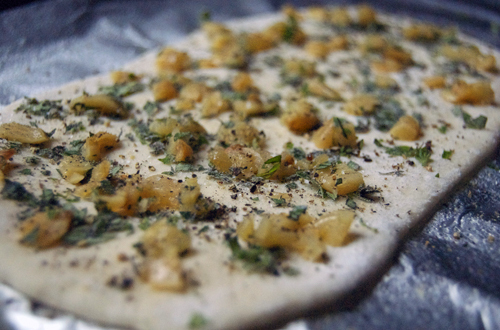 Sprinkle each flatbread with garlic, basil, salt and pepper then drizzle with remaining olive oil. Bake at 450F until golden around the edges (about 10 minutes). NOTE: If garlic begins to burn, lower temperature to 400F for the last few minutes. This sounds amazing! I love roasted garlic, and I love bread – Can’t wait to try this! Amazing bread. Everything with garlic is good in my book. Roasted garlic is even better! This looks wonderful. My basil bush is going wild and this recipe would make good use of it. Thanks. Roasted garlic, yum! Your pictures look amazing. I would scarf this down so quickly. The only thing better than roasted garlic is MORE roasted garlic. I want some of this right now. No sharesies. This looks very good. I agree with Julia why would anyone delete the garlic. I also want to say that I think your blog is fantastic. Over the last couple of months I seem to be picking more recipes from here than just about any other site I visit. Keep up the good work. Oooh this sounds good- i can practically smell the roasted garlic. The pics look delish too! Love garlic so I know this flat bread has got to be good! Oooh sounds delish! I’ve tried making bread and half the time it doesn’t turn out as lovely as I thought it would. This recipe seems simple enough, and I LOVE roasted garlic! yum! Roasted garlic anything is great by me- this looks so delicious! 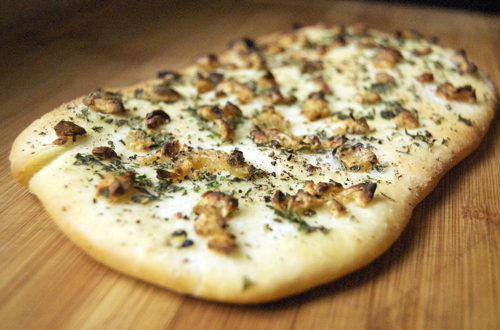 Mmmm Flatbreads and garlic, what a great combination. It looks great. I recently made some swedish flatbreads – knäckebröd. I just pulled lots of garlic from the garden and I love baking bread. It is really hard to screw up flatbread (that is why I like it!!!) Thanks for the recipe! Garlic is my fav and I can never cook without garlic. This flat bread looks lovely. I think I would add a bit of Parmesan cheese. We make these on the BBQ in the summer time. I make the dough slightly more wet and grease the grill. 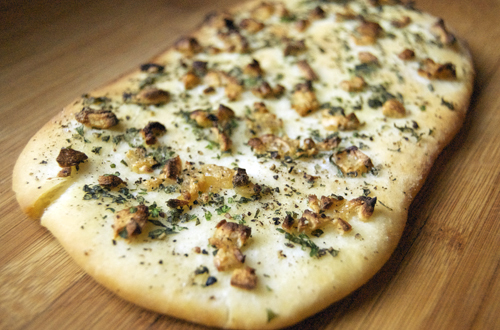 Was the garlic roasted before you put it on the flatbread? It certainly looks that way in the picture, but the recipe isn’t clear. I love flatbread! I have never made it but I will be soon. Thanks for this one, it looks amazing. Congratulations on making FoodBuzz Top 9! I just made this, and it turned out DELICIOUS! Thanks again for a great recipe! Mine was, but i think it would be fine if you just cut the garlic into smaller pieces and baked it unroasted. Wow,this looks easy, I will have to give it a try. I love garlic too, but should I roast it before it goes on the bread, or does it get roasted in the oven as the bread bakes with it? This sounds wonderful (and the photos are great)! You can roast is before hand if you want large chunks of garlic, like I had. Or, you can chop the garlic into smaller pieces and just let it roast with the bread. how many points for the bread? It’s in the oven right now and the aroma is SO good I’m about to reach in and grab it with my bare hands. Garlic and bread. Does it get any better than that? I know this would be gone in one guilt ridden sitting at our house. This looks delicious. I think I’ll try it with a little bacon on it, and maybe an egg for breakfast tomorrow. This looks great! I would love to dip it in some home-made hummus. Yum! Great looking flatbreads, I might give this a go tonight. They must have been brainwashed. It’s the only logical answer!